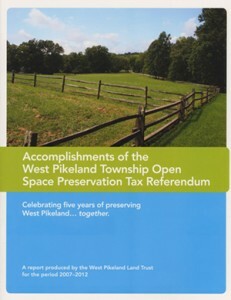 In 2007, the residents of West Pikeland Township decided to invest in preserving our community’s green resources by voting for an Open Space Referendum which established a tax supported fund solely dedicated to the protection of open space in the township. Since then, the West Pikeland Board of Supervisors and West Pikeland Land Trust have been hard at work conserving open spaces, building a trail network, and linking land and people. During the first 5 years of the referendum (2007 through 2012), $4.6 million worth of land was preserved for just $1.8 million in open space funds. That’s a tremendous return on investment! See all the accomplishments of the Open Space Referendum in West Pikeland Land Trust’s newly released report.